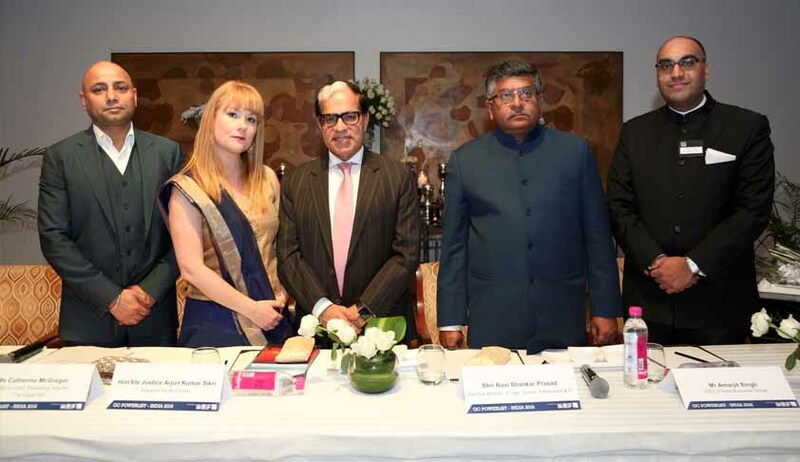 Legal 500 – the leading global legal directory, unveiled its first edition of GC Powerlist for India yesterday at an exclusive and high profile ceremony at Hotel Taj Mansingh, New Delhi. The event was guided byIndia Business Group – the Knowledge Partner for this initiative. The event was attended by more than 100 guests comprising of the Who’s Who from the legal industry. Law Minister Mr. Ravi Shankar Prasad was the Guest of Honour while Justice of Supreme Court – Justice A K Sikri was the Chief Guest. The GC Powerlist series from The Legal 500 highlights the most influential in-house lawyers in business today. Over the last 3 years, the series has covered regions and countries over the globe: recent lists include: UK, USA, France, Italy, Iberia, Germany, Africa, Middle East, Nordics, Switzerland, Russia and Ireland. The GC Powerlist for India recognises 100 individuals, known for their outstanding work in the country and have contributed significantly to the rapidly growing in-house legal market. The individuals featured on the list are chosen through a comprehensive research process, which includes nominations, background research and interviews, the most deserving general counsel are chosen to appear on the list. Speaking at the event, Mr. Amarjit Singh, CEO of the India Business Group, said: ‘The India Business Group is very pleased to be assisting The Legal 500 with production and launch of its inaugural GC Powerlist for India, particularly at a time when the Indian economy is going from strength to strength. It has been a pleasure to work with The Legal 500 team, and advise on key strategic matters in the Indian market’. ‘The Legal 500 has used its 30 years of legal market research to create the GC Powerlist series. The inhouse legal profession has been growing in countries across the globe in the face of cost-conscious businesses, increasing regulatory scrutiny and a paradigm shift in the approach to risk. The Indian inhouse market is a fine example of this change. The Indian edition of the GC Powerlist highlights some of the most impressive in-house individuals in the country, covering a range of domestic and international companies, as well as public sector.’ – said Dominic Williams, Head of research, The Legal 500: GC Powerlist Series.